Meitu, Inc., an AI-driven mobile internet company that has been transforming the way its users create and share their beauty, has officially launched the Anime Avatar feature on the Meitu App. The new feature not only automatically generates a highly personalized cartoon image, but also mirrors the user's facial expressions and movements in real time, distinguishing it from the avatar builders of yesterday. Catering to kawaii (cute) and cosplay culture enthusiasts, Anime Avatar is the world's first AI-based real-time anime avatar generator on a mainstream consumer app. The Anime Avatar feature can distinguish between tens of thousands of clothing and hair colors, thousands of facial features, hundreds of hair styles, twenty different kinds of accessories, and various skin colors and face types. All of this ensures that the resulting anime avatar both closely matches the attributes of real portraits and is a highly recognizable cartoon image. Users can select the "Photo" button to have the interface display both their original photo and the anime image. The feature allows users to customize their facial features, outfits, clothing items, hairstyles, accessories and backgrounds -- including for special occasions. This year will see the release of Christmas-themed costumes for the avatars and users will have even more custom themed options for future holidays, such as New Year, Spring Festival, and Valentine's Day. The Anime Avatar feature also allows users to create personalized videos and emojis. By selecting the "Video" button, users can record movements of up to 10 seconds, or further personalize the video by adding music and vocal recordings that can be customized by modifying their tone and pitch. By selecting "Emoji", users can capture unique facial expressions of up to 5 seconds in length that will be replicated by their anime avatar. They can also add stylized messages to further personalize their emoji. This feature comprehensively uses MTlab's AI technologies, including but not limited to: facial detection, facial landmark detection, facial attribute analysis, image segmentation, hairstyle recognition, clothing and accessory recognition, and image generation. Augmented Reality (AR) technology is also used to render the final product. The facial landmark detection technology can locate 118 key points on the face and can analyze the face in real time with stability and accuracy in complex situations. The image segmentation technology can accurately segment the human body, skin, hair, and facial features and divide an image into a number of non-overlapping regions by analyzing contours, occlusion relationships, colors, textures, shapes, etc. The hair recognition technology identifies the basic attributes of human hair through a single portrait photo, including length, curl, bun, ponytail, bangs, volume, orientation, etc. The clothing recognition technology identifies the type of clothing, pattern, collar, sleeve length, and so on. The accessory recognition technology recognizes accessories such as glasses, hats, and jewelry. The image generation technology constructs a generation model, creates a conversion relationship between the real and desired images, and then outputs the anime-style effect. The AR technology enables real-time interaction between the real and virtual worlds through real-time modeling and rendering. The technological process works like this: users provide the initial data input for analysis by taking a photo or uploading an image. The AI technologies will then detect and analyze the image's attributes including but not limited to gender, age, facial and eye shape, eyebrows, skin color, facial expression, hairstyle, hair color, clothing, clothing color, accessories and accessory colors. By using models to map and construct the relationship between the real and the anime images, an anime image with a remarkable likeness to the original is created. The AR technology then allows the avatar to mirror the user's facial expressions and movements in real time. An AI-driven company, Meitu has integrated these technologies into its suite of beautification apps across the board: the facial landmark detection technology is used as a basic technology in almost all Meitu products, laying the foundation for fine beautifying and exquisite virtual makeup effects. Facial attribute analysis is used to provide users with personalized beauty-enhancement features, virtual makeup effects, and beauty product recommendations. Image segmentation technology has a number of uses such as background replacement and blurring. Image generation technology has been applied to many functions such as AI Portrait and Andy the ArtBot. AR technology has been applied to virtual makeup and AR filters like Marvel's Venom-themed AR effect, which was recently released. 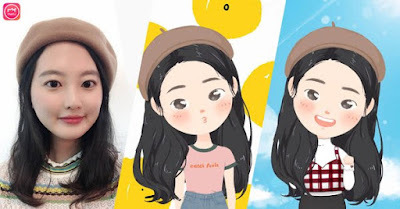 Enhancing the image rendering accuracy to an even greater extent, Animie Avatar is an extension of Andy the ArtBot and Hand-Drawn Selfies, Meitu's highly successful AI-driven functions that also generate real-time illustrations based on users' real-life photos. In January 2017, Meitu launched its Hand-Drawn Selfie Function, turning users' portrait photos into unique illustrations. In November 2017, Meitu launched Andy the ArtBot, an upgraded version of the hand-painted selfie function. The Meitu App took the top spot in the App Store Rankings of six countries earlier this year, including Japan, South Korea, Thailand, Egypt, Saudi Arabia, and Mongolia: much of this success can be directly attributed to Andy the ArtBot. Established in October 2008, Meitu (SEHK: 1357) is a world leading AI-driven photo/video processing and social sharing company headquartered in China. With a mission "to inspire more people to express their beauty", the company has developed a rich portfolio of software and smart hardware products based on the concept of beauty that include, but not limited to the Meitu app (social network), BeautyCam (photo editing & selfie camera app), Meipai (pan-knowledge short video platform), and Meitu Smartphones. Meitu's suite of apps have been installed on over 1.5 billion unique mobile devices and have amassed a massive worldwide user following, with over one third coming from outside China in countries that include the United States, Brazil, Japan, South Korea, India, Thailand, Indonesia, Malaysia, the Philippines, and Vietnam. With the largest database of human portraits on the planet, Meitu leverages AI in the pursuit of its mission. MTlab, Meitu's R&D hub, is dedicated to AI and imaging innovations like Computer Vision, Deep Learning, and Computer Graphics. Meitu has repeatedly ranked as one of the top Android and iOS apps in the world. For more information, please visit at corp.meitu.com/en/.